The Minnesota Wild realize that every win helps them tighten their grip on the crowded Northwest Division. If they want to assure themselves of another two points and sole possession of first place, they won't look past their next opponent. The Wild seek their third straight victory when they return to Xcel Energy Center to face the last-place Los Angeles Kings on Sunday. Minnesota (36-24-5) has won its last two games after losing four in a row from Feb. 19-26 - a stretch during which they dropped behind Calgary in the Northwest. The teams are currently tied for the lead in the highly competitive division, where the top four teams are separated by just three points. "These games are important," said Wild center James Sheppard, whose team seeks to return to the playoffs for a second straight season. "You can't afford to lose the first two then win the next two, not heading towards the playoffs. We can't have any more of this." With Calgary idle until Tuesday, the Wild can regain the top spot with a win over Los Angeles. They'll be looking to build on a successful three-game road trip that concluded with Friday's 3-2 victory at Florida. Brent Burns had a goal and an assist, while Mikko Koivu and Stephane Veilleux each scored for the Wild, whose last six wins have all been one-goal decisions. Minnesota, seeking its first three-game win streak since Jan. 24-Feb. 2, has totaled six goals - three coming on five power-play chances - in two games after scoring just four times during its four-game slide. The Wild hope to continue their recent offensive surge against the Kings (26-35-4), who have been outscored 16-9 while losing five of the last six meetings. The first two matchups this season came in Los Angeles, with the Kings winning a 4-3 shootout on Oct. 16 before falling 2-1 on Dec. 15 in the most recent contest. The series now shifts to Xcel Energy Center, where Minnesota will play six of its next eight games. The Wild, though, have lost their last two games there, and look to avoid losing three straight at home for the first time since a four-game skid from Jan. 4-20, 2007. Los Angeles has dropped three of its last four visits to Minnesota, and has lost the first two contests on a four-game road trip following a 5-2 defeat to Colorado on Saturday. Michael Cammalleri and Rob Blake each scored and Anze Kopitar assisted on both goals for the Kings, owners of the NHL's worst record. The Kings hope to avoid losing five straight away from Los Angeles for the first time since falling in six consecutive road contests from Dec. 5-22. On Saturday, Dan Cloutier made 23 saves in his fourth straight start in place of No. 1 goaltender Jason LaBarbera, who remains sidelined by a groin injury and may not be ready to return Sunday. Cloutier is 7-10-1 with three ties and a 2.58 goals-against average in 21 career games versus Minnesota. 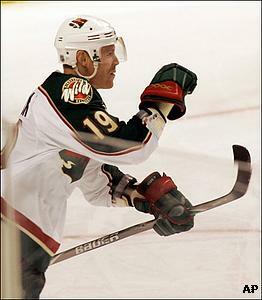 Wild right wing Marian Gaborik, who leads the team with 33 goals and 64 points, ended a four-game point drought with an assist on Friday, but may be able to regain his scoring touch against the Kings. Gaborik has 14 goals and 23 points in 22 career meetings, tallying six goals and four assists during a seven-game series point streak.